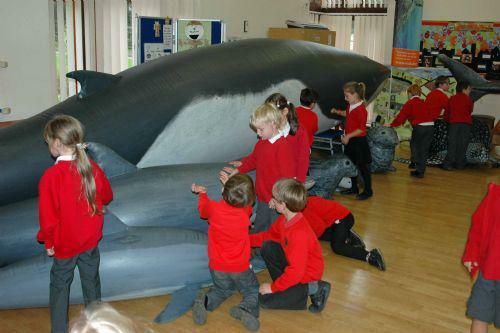 The Marine Conservation Society's Cool Seas roadshow came to visit us before half term. The children were introduced to some of the larger marine creatures we have in our waters, from the minke whale, bottlenose dolphin, basking shark, leatherback turtle and seals. 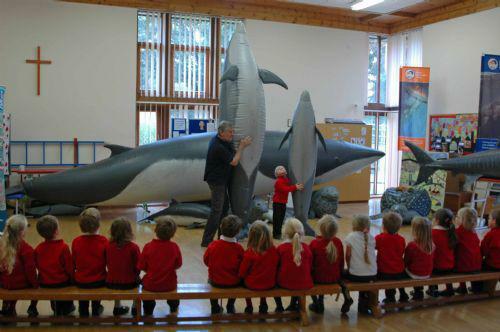 The Roadshow uses life-size inflatable models to teach the children the size of these creatures and what they feed on. They introduced the concept of food chains to Falcon Class and explained how the leatherback turtle comes into our waters to feed on jellyfish in the summer months. He also explained how our litter can affect these creatures, how sometimes turtles eat floating plastic bags or balloons by mistake, thinking they are jellyfish and the harm that this does. To encourage responsible disposal of litter they explained how plastics can be recycled into other items such as synthetic clothing. The children were given a challenge - to recycle their plastic bottles and bring the lids into school. If each child brings in 20 lids the school will get a football strip made out or re-cycled plastic. The children had a really instructive and interesting day.